Good news! The persistent graphics driver related issue that has been around since Mac OS X 10.7.3 has finally been resolved with OS X 10.8.2 (12C60). This glitch prevented the highest resolution (768 x 1366) from being displayed in portrait mode on the 11" Air. This resulted in a black strip being displayed at the top and bottom of the screen. Click here to download a trial version before purchasing. Like the app, but don't feel like paying full price? Consider sending me a Bitcoin tip. Use this Bitcoin wallet address and send me an email using the contact form below. Pay what the app is worth to you and I will send you a license. What does Screen Rotate for Mac do? The app rotates your MacBook Air’s display 90 degrees to the right or to the left allowing you to hold your laptop more naturally, like a book, with the hinge/spine oriented vertically. Screen Rotate also rotates the touchpad tracking allowing you to conveniently move the pointer with your thumb. The rotation is controlled by clicking on one of three buttons in a tiny window that appears in the lower lefthand corner of the screen when the application is running. Motion sensors are not used. Why would I want to rotate my display? We’ve found portrait orientation enabled by Screen Rotate is great for using some of our favorite reading and browsing applications like Amazon’s Kindle and Safari’s Reader. Mac Screen Rotate is also great for reviewing and editing documents and spreadsheets since you can see much more of the page. We think that you will be amazed by the difference that a tall skinny screen makes compared to a short wide one for certain activities. It is great for reading blog posts and browsing the internet. The benefits of relaxing in your chair instead of hunching over you laptop cannot be overstated. What new hardware will I need? None. That’s the beauty of it. Traveling light? Try leaving some of your other gadgets at home. Mac Screen Rotate was originally conceived with the 11.6” MacBook Air in mind. The widescreen orientation and light weight of this model (or the 13” MacBook Air for that matter) really lends itself to being held like a book. That being said, we have users that love the app for their 13” MacBook Pros as well. If you’ve got a 15” or 17” MacBook this probably isn’t of much benefit to you as the size and weight of those models is probably a bit cumbersome to hold like a book. We really can’t think of a use for this app for desktop users, but if you think of one we’d love to hear about it. How do I control the rotation? Buttons! A small control panel is displayed in the lower lefthand corner of the screen when the application is running. Simply click L or R to rotate the screen to the left or right. Click W to return the display to widescreen format. Display in standard widescreen format. 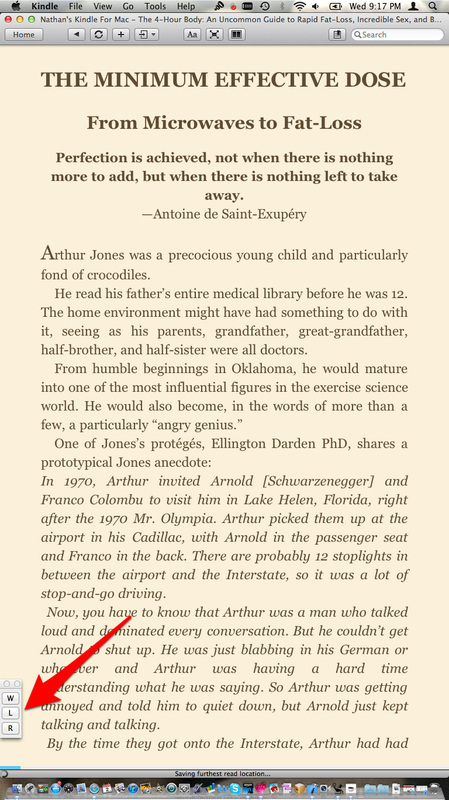 Note that two columns are shown in the reading window of the Kindle app. Display in portrait format. Note that more text is displayed in a single column than in both columns above. Please note that several users have stated that the keyboard shortcuts do not work on some 2011 MacBook Air's. This led us to create the new button window interface, which we happen to like better anyway! Does it work with Mac OS Lion? You bet. Screen Rotate for Mac works great with the new operating system. Please note: A few users have reported that the keyboard shortcuts do not work properly until after rebooting when using Lion. If you have this problem, please try this first. I read somewhere that you can rotate your screen for free with a hidden Mac OS feature. Why would I ever pay to do this? Hold down Option + Command and click Displays. Not using an external mouse or trackpad? Now you have a rotated screen, but the touchpad does not move as you expect. We found this frustrating and it is the primary reason why we think Mac Screen Rotate has something more to offer users. 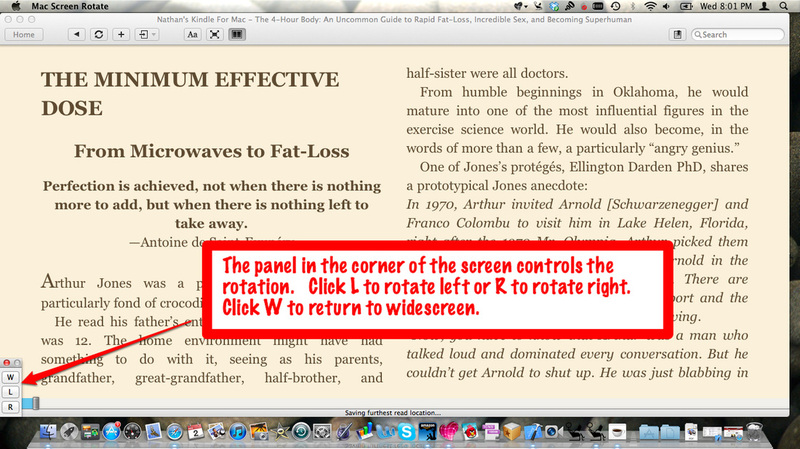 Give Screen Rotate for Mac a try. We think you'll like it. Now there are three options for purchasing. Apple, the Apple logo, Mac, the Mac logo, MacBook, MacBook Air and iPad are trademarks of Apple Inc., registered in the U.S. and other countries. © 2013 Nathan Stevens. All Rights Reserved.